I am back. Nothing newsworthy in that, but there are two things from Texas that I do want to mention. Recently, we took some friends from Foam Lake on a nature hike in Llano Grande nature preserve and the main item on the list was to see an alligator or two that live there. We did see one huge one sunning himself, but my first highlight was seeing four Roseate Spoonbills feeding in the shallows. These rosy, goose-sized waders with their spoon shaped bills were quite spectacular, at least to me. I wanted to show our friends the Paraque that I wrote about in Article No. 76. This same bird had been roosting there for the past several years and was a sure thing. My second highlight, sadly, was seeing only a pile of Paraque feathers where the bird normally roosted. It seems that it became lunch for some predator. I hope it got a stomach ache. Since coming back, I have enjoyed seeing our northern birds. Because of the unusually warm weather, some summer birds such as Robins, Flickers and Grackles are back early. When the weather recently took a turn for the worse, all three of these birds were in our backyard eating last year’s chokecherries that were still hanging on the trees. The seed eaters such as Juncos, Purple Finches and Siskins are making good use of our feeders. In the last few days Goldfinches and White Throated Sparrows have arrived. There will be more to come. 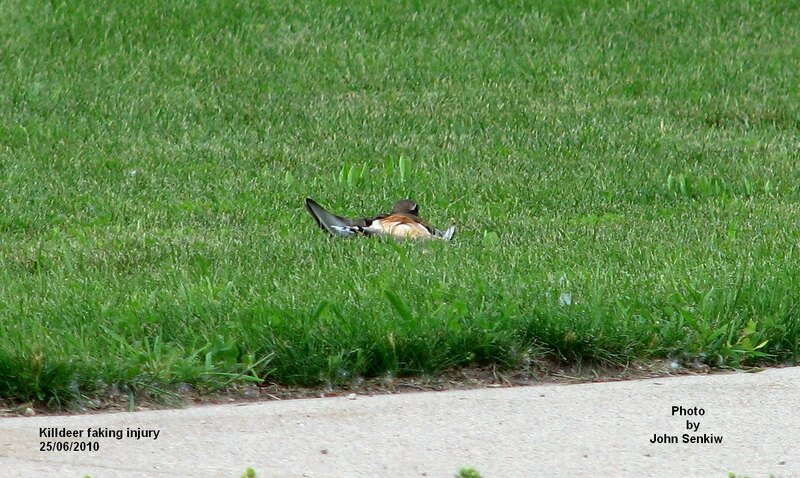 For this week I want to cover a bird that only occasionally can be found in a backyard, but one that just about everybody knows – the Killdeer. The Killdeer is a Robin-sized wading bird that spends a lot of time far from water. Its physical characteristics are such that one can easily identify the bird by sight alone and without binoculars. 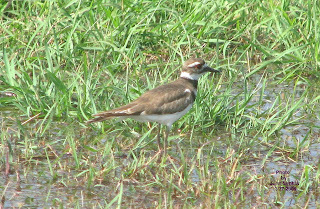 A wader with a brown head, back and tail and a white neck, breast and belly topped off with two very distinct black throat stripes or bands is the Killdeer. 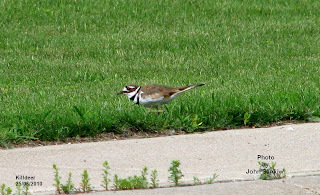 More often than not the Killdeer can be identified by its call before it is seen. 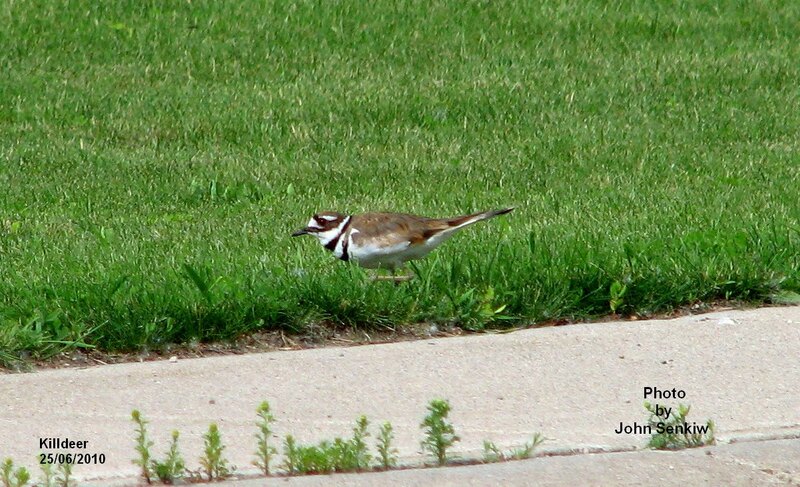 Its clear and far carrying call of “killdeer” is distinctive. It can literally be heard any time of day or night and I have often heard it calling at night as it is flying overhead. Why it flies at night is hard to say. The males and females are the same. It is even a more interesting bird once it starts nesting. It nests quite some distance from water and often in newly tilled fields or gardens. Being rather confiding it will even nest in towns. When I was on the farm, it was an annual spring ritual, during seeding, to keep moving Killdeers’ nests in order to avoid destroying them with machinery. The Killdeer always accepted the eggs in a new location in a man made nest. Whenever danger comes close, the female runs off the nest and pretends to have a broken wing thus leading the predator away. At this time the orange tail is clearly visible. Once the predator has been successfully led a safe distance away, the Killdeer makes a miraculous recovery and flies away leaving a confused predator behind. The young are precocial (they can run around and feed themselves shortly after hatching) and look just like their parents except with only one throat band. As kids, we used to monitor Killdeers’ nests and play with the newly hatched young before they left for the nearest slough. They certainly are cute and cuddly. 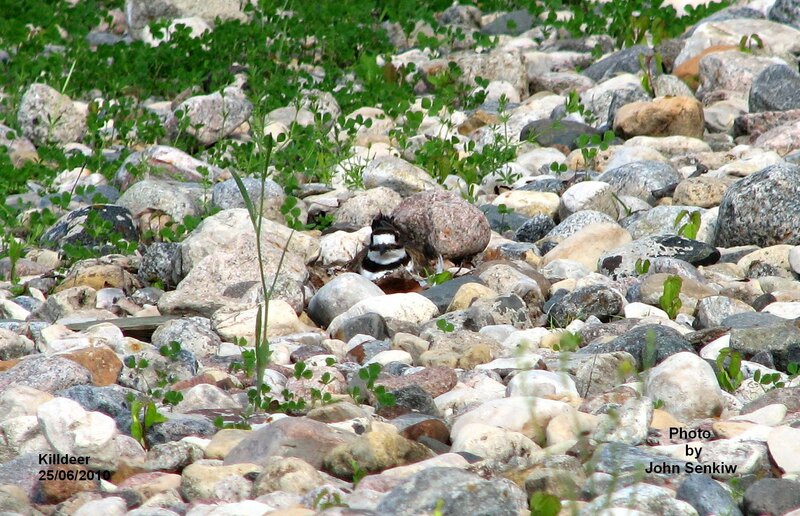 The Killdeer belongs to a world wide family of wading birds called plover of which five can be found in Saskatchewan. Two of them, the Killdeer and the rare Piping Plover, nest here; three of them, Black Bellied, Golden and Semipalmated are transients and best seen in the spring. 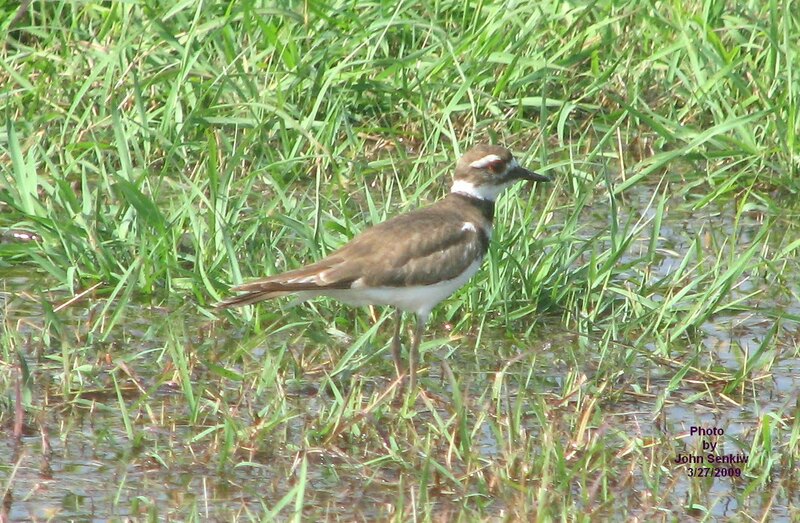 Even though Killdeer are common here the first picture was taken at Llano Grande nature preserve in Texas in February. 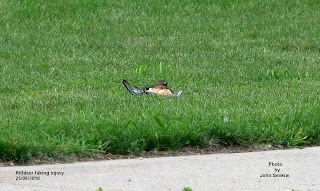 The other three photos were taken of a nesting Killdeer in our neighbour's yard across the street. She certainly put on a show with her broken wing routine. This is the last article from Texas for this winter as we should be home a week from the time of this writing. Then, it will be back to spring transients and early summer arrivals. I am looking forward to that. This was a good winter for birding but not exceptional. Last week we went on a late evening nature hike to observe owls. We did not see any, but we did see our first scorpions and tarantulas. Scorpions climb trees at night looking for food. Here, a flashlight with an ultraviolet light filter causes the scorpion to glow a ghostly green against a purple background making it easy to observe them. Shades of CSI! The tarantulas (giant hairy spiders) were found on the dirt path warmed by the daytime heat. They could be and were picked up and handled. Even though they are gentle creatures by nature, they can bite if roughed up. My wife enjoyed carrying hers around. Several days ago my wife and I were outside enjoying the late afternoon sun when the bushes about ten metres away exploded with hysterical squawking and screaming giving me quite a start. Suddenly, there were Chachalacas everywhere running in all directions but staying close to the bush. All became clear when a juvenile Cooper’s Hawk flew by and landed in a tree about two metres right above the Chachalacas. The noise persisted and then really got loud when the hawk flew down and started to chase the Chachalacas in the bush. One bird panicked and ran out of the bush right in front of us and then took off in flight. We could plainly see the terror in its eyes and hear the fear in its squawking. The hawk kept chasing the Chachalacas in the bush amidst a lot of frightful squawking but none were taken. The hawk returned to its perch, sat for awhile, then flew away. The Chachalacas were lucky in that the hawk was a juvenile and not that good at hunting. An adult would probably have gotten one, especially the one that ran out of cover toward us. Next day the Chachalacas were back as if nothing had happened. Humans with a scare like that would have needed counseling. For my final bird of Texas for the season, I have chosen the Golden Fronted Woodpecker. It is very common here and seems to like people. Our trailer park is full of them. The name is appropriate as both males and females sport a golden yellow patch on their foreheads and napes (back of the heads). The male also has a red cap just above the golden forehead and another just above the golden nape. 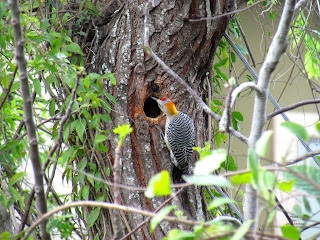 Unlike any other woodpeckers that I have run into, this is the only one that seems to like citrus fruit, especially grapefruit. 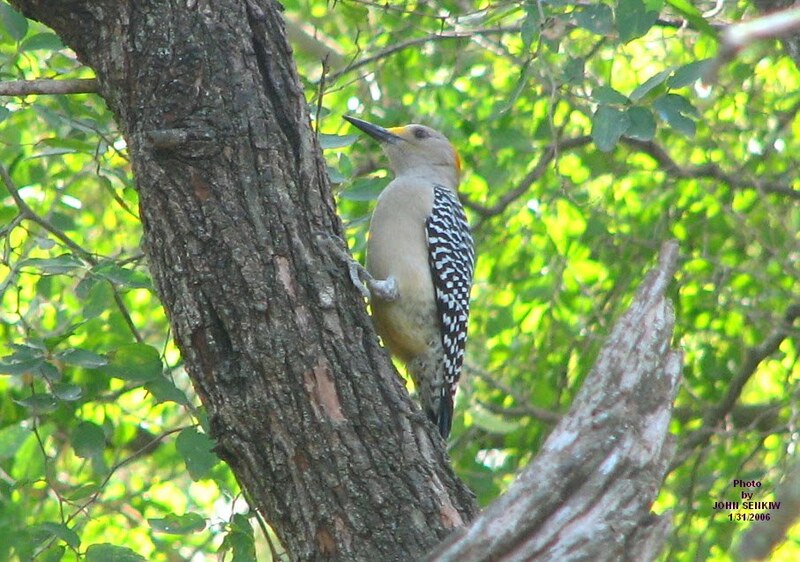 Overall, they are grayish brown birds that look and behave a lot like our flickers except the flickers are larger. This being the mating season, woodpeckers are drumming and staking out their territories. Before Europeans settled the Americas, woodpeckers liked to choose dead hollow trees to drum on because they would resonate and carry the sound a long ways. Today substitutes are utilized. One of the woodpeckers’ favourites seems to be metal clad buildings. When one starts drumming on our trailer the entire structure resonates. It is noisy but enjoyable. 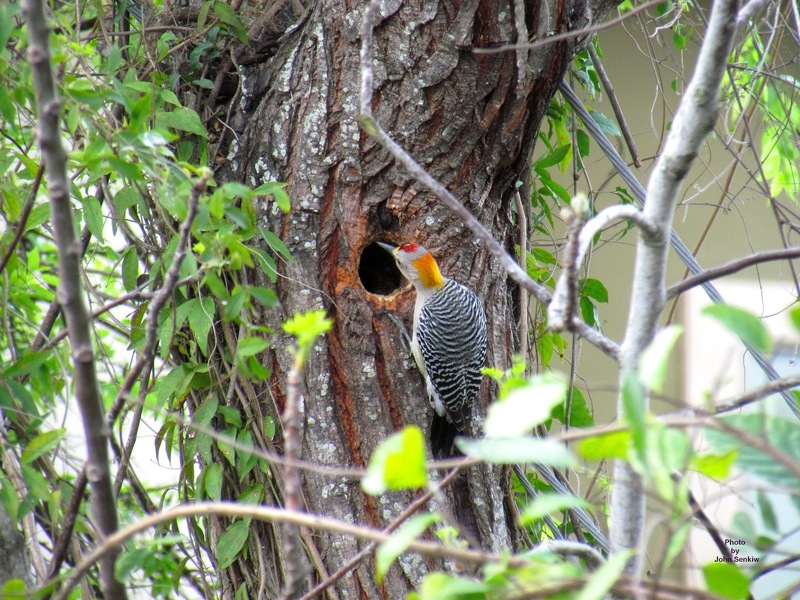 This spring, a pair of Golden Fronted Woodpeckers drilled out a nest hole in a tree in our backyard. It is too bad that we will not see the family being raised. So it is.